As the Squad Leader of the Elite Warriors, Nikhil Kozar was the largest warrior in the Kaliszian Empire. When a shuttle crashes on one of their planets the search and rescue mission turns into something much more complicated. Mackenzie ‘Mac’ Wharton had agreed to guide a group that had wanted an adventure on her mountain. They got more than they bargained for when they were all abducted by a group of aliens called the Ganglians. Badly beaten and barely alive Mac finds herself in the arms of the largest male she’s ever seen. She should fear him, should be fighting to get away from him, but there was something about the massive male that called to her. 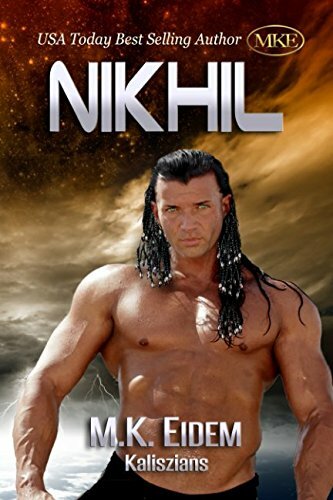 A traitor threatens the Empire… Someone wants Nikhil dead…. The Zaludians want Mackenzie back… And then there was the secret she’s keeping…. Would it be the one thing that finally brought down the Kaliszian Empire? Or would it be the first step in its rebirth?